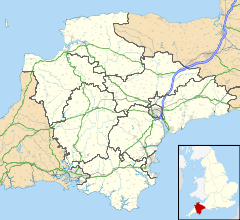 Kenton is a small village located near Exeter, the capital of Devon, England. It has two restaurants, a pub, two hairdressers, a primary school, a mediaeval church and is near Powderham Castle.It is also the home of the Kenton Dolphins Football Club. The centre of the village was rebuilt in brick immediately after a fire on 16 April 1856 which destroyed 24 dwellings. The church is dedicated to all of the saints and is a fine building of the 14th century. It is built of red sandstone and the arcades are of Beer stone. According to John Betjeman "the full-aisled Devon plan at its best". The tower is handsome and the rood screen is massive and stately with ancient colour and a good series of figure-paintings. The pulpit is medieval and the reredos is by Charles Eamer Kempe. The adjacent almshouses were built in 1875. ^ a b Bond, Ann (2012). "The 'Great Fire' of Kenton and the Victorian Rebuilding: the making of a distinctive architectural heritage". Aspects of Devon History. Devon History Society. pp. 265–77. ISBN 978-0-903766-02-9. ^ Betjeman, John, ed. (1968). Collins Pocket Guide to English Parish Churches; the South. London: Collins. p. 162. ^ a b (in French) "Le comité de Jumelage". saintlambertdulattay.fr. Retrieved 2011-11-12. ^ a b (in French) "Jumelage". linkebeek.info. Retrieved 2011-11-12. Wikimedia Commons has media related to Kenton.